Ethical water brand Belu started out with a simple idea: that there is a better way to do business by minimising environmental impact and investing all profits in ending water poverty. Ten years on, Luke Nicholls investigates how the not-for-profit social enterprise is using its sustainable ethos to drive industry-wide change. Karen Lynch: "Ethical thinking can make your business stronger, more appealing and more profitable"
In 2009, Belu had run up debts of almost £2m and was donating just £30k a year to charity. Today, the business is flourishing; with a turnover just north of 4.5m and more than £530k given to clean water charity WaterAid. The reason for this turnaround? Former Emap and Barclays executive Karen Lynch, who was brought in to lead the company in 2010 and got to work restructuring the business model - effectively turning it on its head. Everything from the sales teams to distribution was outsourced, products were re-branded and re-designed and Belu shifted its focus from consumers to hospitality businesses. The Hertfordshire-based firm has doubled in size over the past two years and is now poised to go global. One thing Lynch was insistent must remain consistent throughout this turnaround was Belu's ethical and environmental credentials. In fact, the company's growth has been offset by significant reductions in its footprint - its latest Impact Report makes for good reading, with a 29% reduction in emissions off a 2010 baseline and the development of a new lightweight glass bottle saving 850,000kg of glass annually. All the while, Belu has remained the only bottled water company to be 100% carbon neutral to a PAS 2060 standard. "We've been very cautious with our business growth," explains Lynch. "We're actually quite risk-averse, but we're really bold when it comes to exploring opportunities that can make us and our customers more sustainable - and it works. "If we didn't declare a profit, I believe some of the companies we've worked with and a lot of our customers would discount the initiatives that Belu does as unimportant. There's this real hang-up in business that you can't invest in reducing footprint because that will reduce return to shareholders. Our mission is to prove the exact opposite: good ethical thinking can make your business stronger, more appealing and more profitable." Lynch admits that Belu's green growth hasn't been without its difficulties - particularly when it comes to maintaining brand values. "The message we sometimes struggle to get across is that we're first and foremost an environmental brand. The reason we struggle to get that message across is that everybody very quickly clamps onto the fact that we now give all of our profits to WaterAid, we save lives. "But beyond that, generally, consumers are just too busy to care and there's an assumption that we and retailers should do the environmentally-friendly bit for them. "We're environment-first but of course we need to make sure that the model is sustainable itself. We're all about incremental improvements but ultimately we want to prove that it's worth doing. Otherwise, how can we demonstrate to our industry that they should invest in processes that reduce carbon footprints?" In terms of social impact, Belu recently announced an extension of its partnership with WaterAid, which will see the social enterprise donate at least £1m to the clean water charity by 2020. And the brand is continuing to innovate on the sustainability front. Two recent initiatives that have helped Belu reduce its own environmental impact include 'Green Glass' and 'Ethical Glass' - both of which saw Belu opting to be collaborative rather than competitive in the marketplace. Green Glass saw the introduction of green-coloured still and sparkling glass bottles; to give customers who do not want to buy imported water - with its larger carbon footprint - a continental-looking alternative, to rival popular European water brands. The results have been impressive; with the average recycled content of green bottles made in the UK standing at 74%, against 29% for clear glass. Meanwhile, Ethical Glass, launched last year, saw Belu collaborate with glass packaging specialist Rawlings to produce the lightest weight glass bottle currently available on the UK market for mineral water, offering the hospitality sector a simple way to make a significant reduction in their carbon emissions. The results: Belu's glass bottles are now 18% lighter than previous designs, leading to a further 11% reduction in the firm's carbon emissions. "These initiatives are examples of developing a greener product where everyone is a winner," says Lynch. "And it goes to show how simple choices in purchasing can have a dramatic effect on environmental impact. "With Ethical Glass in particular, we created an alliance with our competitors - we took away the idea of competition and talked to other producers so that we could all reduce our footprint in the market. So what's next for a brand that is seemingly doing all it can to be as sustainable as possible within its own operations? Belu's Impact Report frequently mentions a willingness to be more collaborative with more businesses - even 'rivals' - and this is where the real challenge lies for Lynch and Belu; to be even more proactive, promoting best practise right across the supply chain and sharing these ideas with others. "It's complicated when your ultimate goal is essentially to eradicate your own company. But the water market in the UK is still growing, so we've got two choices - Belu could be a campaign brand, but how does that make money? Or we can try and improve the industry and make it better - that's the direction we're going in. "Generally, businesses are competitive rather than collaborative. Every business wants to grow but what we need is a dialogue of equal power around investment in better social, environmental ethical business decisions. Sometimes I get frustrated that all of the supply chains we're dependent on don't all talk to each other - there's no strategic alignment. 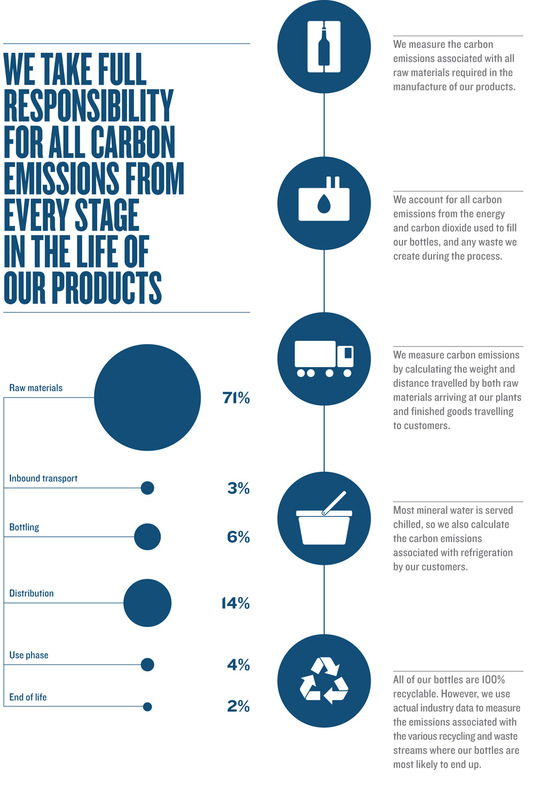 "As a small business, we invest a disproportionate amount of our cost-base to work with experts to measure every bit of carbon responsibility we have right across our supply chain. If every business invested as much time in investing in environmental initiatives as they do in absolute growth then I think we'd have a better economy. But here we are as a small player in the mineral water market, setting the benchmark. "Now, we view our role as creating some traction in the marketplace and some disturbance in the supply chain to get these initiatives going and not keeping them to ourselves. And we're starting to see the effects, with more recycled plastic usage from other companies." Perhaps this is what now defines a truly ethical, sustainable business; one that not only puts the environment first and measures its total impact, but goes a step further, scrutinising its supply chain and being willing to work with other companies to address systemic challenges, recognising that progress accelerates when companies pool their best ideas, resources and clout. Belu, it appears, is doing exactly that. And, as Lynch concludes: "If we can do it with water, anyone can do it in any sector."